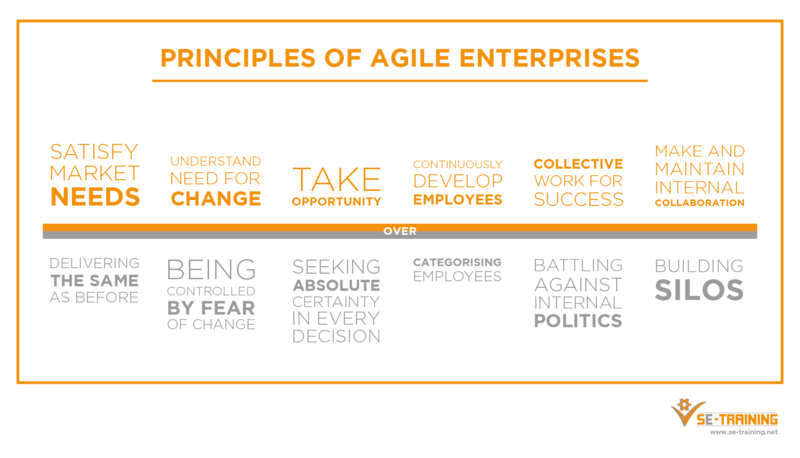 In the coming year, we will be releasing a series of articles through our newsletter proposing some low hanging fruits for realising and implementing agility into enterprises, or simply, for being agile. Surely, the ultimate hot topic of our time. There are significant benefits to applying agility in enterprises trying to manage, overcome and succeed in a technical world that has changed rapidly over recent decades. These changes have been so quick as to overwhelm even some of the most (formerly) agile entities! It is often pointed out how small enterprises (of circa 10 employees) can act with agility in comparison to the international behemoths of this planet. Of course, this isn’t really so surprising when you think about it; the fundamental design of an enterprise consisting of so few people can be readily aligned through the Strategy – Structure – Processes – People – Reward system. Furthermore, decision-making in smaller companies is simpler; there are fewer people to align with on key topics, it’s likely the company doesn’t have to consider the impact of stock market, it won’t have media and political coverage of their decisions, such decisions will only apply to 1 or 2 countries (let alone continents) etc. On the other hand, many of us will probably be very surprised if a large international giant could change their market position, strategy, structure and process quite as quickly as a recently registered company operating from the co-founder’s family garage! So why do enterprises – especially large ones – put such emphasis on applying agility? Quite simply, the world is changing at a rapid pace and in order to stay competitive, an enterprise needs to be able to quickly change and/or respond to change in order to remain profitable. Now. If an organisation is designed with in-built flexibility, then it doesn’t need to change to respond to change, per se… because it is designed to respond to change! An enterprise is essentially a system. From applying systems thinking, we see that its behaviour is determined by: its elements (employees), its interfaces (process, structure) and purpose (strategy). As such, all employees have a role to play in improving the agility of their enterprise. The first step in implementing agility is to become aware of the one’s own practices. Only when this system level self-awareness is realised that pragmatic solutions can be executed. If you believe your organisation can benefit from implementing agility, start with the low hanging fruits. Sign up to our newsletter where we will be distributing posts and articles on just that in the coming weeks and months.